Kate Tym, our compere, kicked off the night with this and had us all squirming in our seats. Really, Kate? Really? And just as we were trying to rid ourselves of the mental image of a President Elect’s ginger moobs, The Magic Wizard cast his spell with the finest drone pop since…well, Tiger, actually. Dan Laidler is back, on form and not before time, ably assisted by a couple of blokes he found in Wetherspoons. David Quantick singlehandedly proved that by changing one word in Bob Dylan’s Wikipedia entry, the entire course of music history as we know it could be seismically altered. In “The Day Bob Dylan Went Disco” we got our Judas moment all funked up; because that’s what he would have wanted. 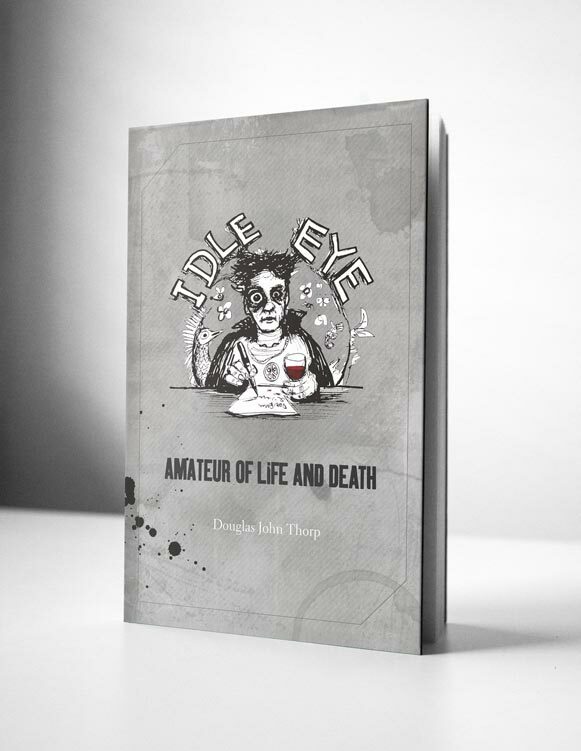 Idle Eye adhered to the old mantra ‘something old, something new, something borrowed’ etc… There was a bit of quality swearing from his potty-mouthed satnav, samples, spot fx and a rather fetching new teeshirt kindly donated by Magda Archer. Yes, his life is crap; get over it. Once more unto the breach, people of Hastings! BB7 is coming back atcha, because we love you to bits and you deserve it. 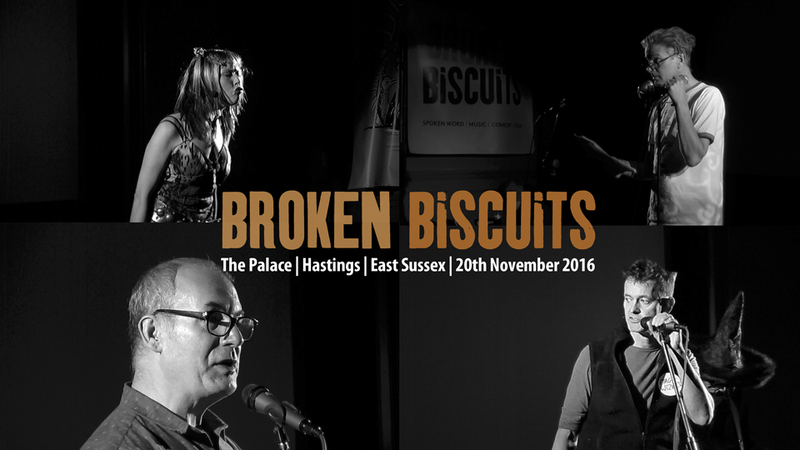 This time, we’ll be at the Palace, right bang on the seafront (near the pier) and newly restored to its former splendour. Can’t wait! We’ll be bringing Jenny Vegas with us (can’t keep her away), with her unique brand of celebrity culture gone a bit wrong, all squeezed into a character you can’t help falling for. Not quite sure how the Bernard Matthews Celebrity Tour of Norfolk is managing without her, but I’m sure we’ll get a letter soon. In blood. 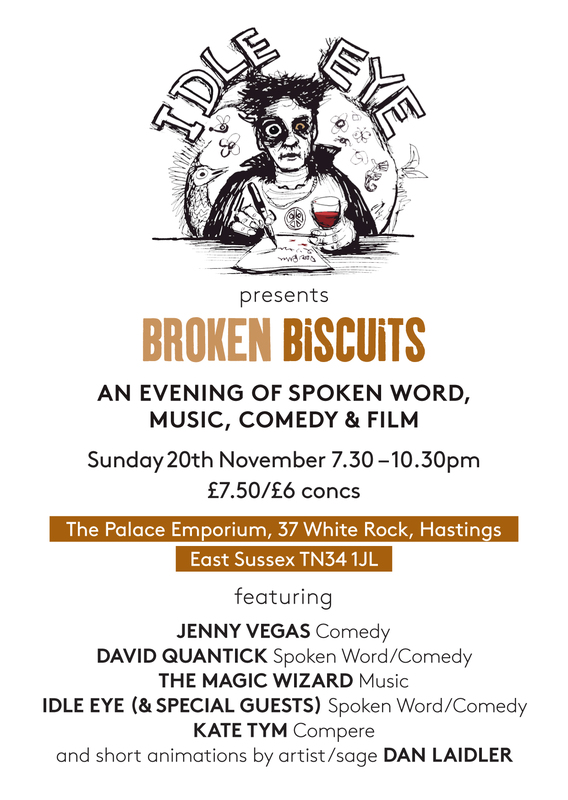 David Quantick‘s back too! And we have it on good authority he’ll be doing a new piece called 20 Joan of Arcs By Orchestral Manoeuvres In The Dark. Anyone who was lucky enough to catch him last time will know that this is going to be quite something. Do not miss it; seriously. 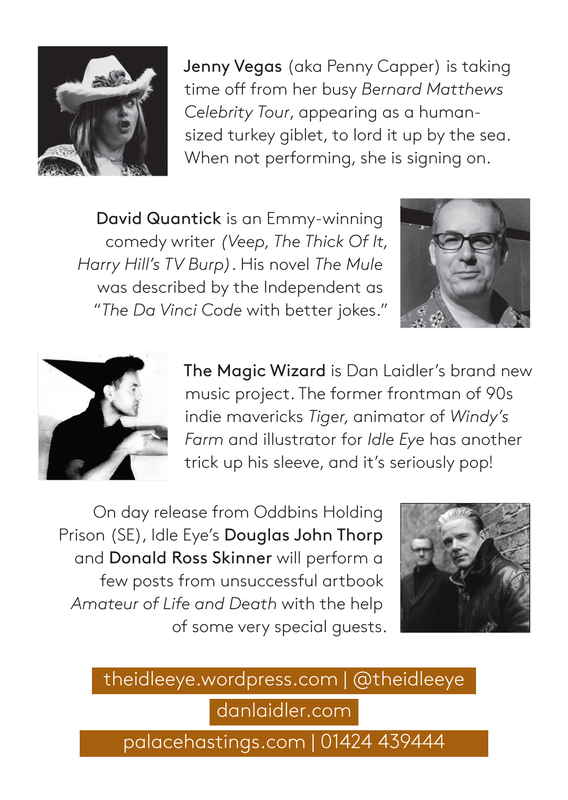 And as if all this isn’t enough, we’ve managed to pull off something of a coup: The Magic Wizard (aka Dan Laidler) is going to out a few tunes for the first time ever. His work with Tiger in the 90s cemented his status as one of the UK’s most enigmatic singer/songwriters, and now he’s back. Thank the bloody lord, it’s been a long wait. Yes, you’ll be getting the Windy’s Farm animations as well. And Idle Eye, now that we’ve worked out how to use the desk and put in funny noises. Also, this time we’ll have a proper compere! St Leonards’s very own Kate Tym has kindly agreed to step in and save me from embarrassing myself in public as per. Worth the ticket price alone.